In "Zipline," Mr. World says "going this fast is kind of like shopping at Eyeglass World." Director Toben Seymour works on camera angles with the Mr. World ‘stunt puppet’ while scouting locations for "Zipline." His goal is to always capture as much puppetry in camera as possible. Seymour and his puppetry team set up a water shot for the “Shark Bait” spot, in which Mr. World’s movements on the dive boat seem almost human-like. Mr. World rocks a dance competition in "Dance," in which he's partnered with a sultry dancer. Lead puppeteer Paul McGinnis rehearsing for the “Dance” spot. A regular collaborator with the director, he also provides the voice of Mr. World in the TV spots. In "Shark Bait," the Eyeglass World mascot, Mr. World, does some unexpected things for a puppet, courtesy of director Toben Seymour of Tessa Films. 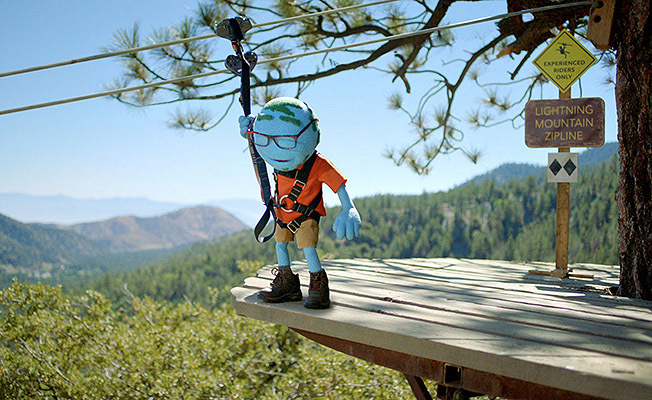 New campaign features Seymour’s puppet as he ballroom dances, ziplines and scuba dives, all to illustrate the benefits of the eyewear retailer. This meant getting the puppet in the Pacific Ocean, building an animatronic puppet that was light enough to dance with and building animatronic legs that could kick and move while being remote controlled down a zipline, among other things. The Mr. World puppet, whose skin is a bright blue, has a globe for a head, a face defined by eyebrow-sized continents, an expressive mouth and various styles of Eyeglass World frames for eyes. Still, he’s able to deliver emotionally resonant performances. “What I love about Mr. World is that his glasses are his eyes,” Seymour says. “They’re the lens through which he can see the world, and each set of frames is designed to match the adventure. His personality and character are always growing with each new thing he does. And the Richards Group scripts gave McGinnis, Seymour and the crew plenty of opportunities to put Mr. World through his paces. In “Shark Bait,” he welcomes viewers from the back of a dive boat, about to take a plunge into “the world’s most shark-infested waters.” He’s seen full-sized in this spot and walking, albeit wearing fins, a wet suit and mask. In “Dance,” he’s seen sporting designer frames at “the world’s most stylish dance competition,” where he does the tango with a sultry beauty whose own specs are pretty hot, too. And in “Zipline,” he’s perched on a tree-mounted platform, about to ride “the world’s fastest zipline,” which he views with a slight amount of trepidation.